So you've finally landed at the airport and made your way to Airlie Beach. Whether it be by ferry from Hamilton Island Airport with Cruise Whitsundays, by coach transfer with Whitsundays 2 Everywhere, or by helicopter with Helireef Whitsundays, walking through the front door of your accommodation brings on a sigh of relief. If you're looking for accommodation near the Luxury Yachts Whitsundays office, here are a selection of resorts within walking distance. Located a short 4 minute walk along the Bicentennial Boardwalk, Coral Sea Resort is certainly the pick of the bunch when it comes to finding the closest resort to stay at pre or post your charter. Boasting uninterrupted views of the Coral Sea, this 4.5 star resort offers a variety of accommodation from Garden View Rooms to top floor penthouses, 24-hour reception, pool and an award-winning restaurant. Located at Shingley Beach, a short 6 minute walk from Abell Point Marina, Shingley Beach Resort offers affordable accommodation nestled in a natural amphitheatre of trees and parklands adjacent to Abell Point Marina. Offering a range of accommodation from studio apartments to three bedroom apartments, 2 swimming pools and a selection of boutique shops underneath, Shingley Beach Resort is another great option for consideration. Airlie Waterfront Bed and Breakfast is centrally located right on the waters edge just a 20m stroll to the beach, 200m to the all year swimming lagoons, shops and restaurants and a 5 minute walk to Abell Point Marina. With a homely feel to it, all rooms are serviced daily and include a continental breakfast each day, ensuring you're relaxed and refreshed pre or post charter. Parallel to the Bicentennial Boardwalk and waterfront to the Coral Sea, Marina Shores exudes luxury in their 1 to 4 bedroom apartments and penthouses. Boasting a 30m pool and tropical gardens, this quiet and picturesque resort is a short 9-minute walk to the Luxury Yachts Whitsundays office and a great choice if you're looking for somewhere to indulge the sences. Across the road and perched on the edge of a point, looking across all the vessels in Abell Point Marina and a short leisurely 14min walk to your charter check-in, Peninsula Airlie Beach offers 1,2,3 and 4 bedroom apartments and penthouses. Expansive views of the marina and waterfront position will make it irresistible to leave. Airlie Beach and the Whitsundays are blessed to have a range of accommodation for tourists to choose from. From backpackers to mid-scale hotels to pure luxury apartments – you’re certainly spoilt for choice when it comes to finding somewhere to lay your head. If you’re booking a charter with Luxury Yachts Whitsundays, and are looking for an equally luxurious place to lay your head the day before or after your charter, here are some of our favourite places to book. 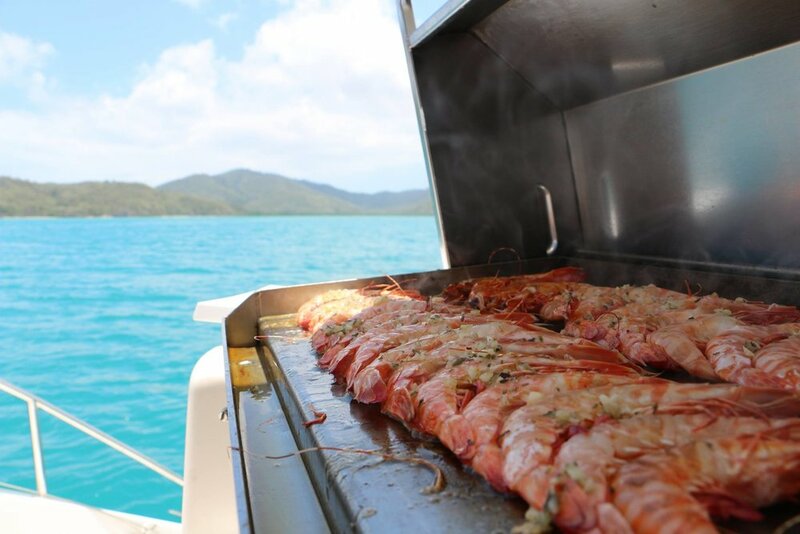 Positioned on the absolute ocean front, and a 2-minute walk to Abell Point Marina and the Luxury Yachts Whitsundays office, Coral Sea Resort is a popular choice for bareboat charterer guests. Offering deluxe suites, apartments, penthouses and beach houses with an award-winning restaurant it’s hard to pass up. Enjoy their degustation dinner poolside featuring fresh local seafood overlooking the Coral Sea or perhaps an intimate and private candlelit dinner in the oceanfront gazebo. Equally impressive is Mirage Whitsundays, offering serviced apartments, villas and penthouses, the resort is located on the serene waterfront near Airlie Beach. Spend time cooling off in one of their large and enticing pools, or in your own plunge pool at your apartment. An onsite gym will keep you happy and not feel guilty after dining at their soon to open restaurant and perhaps a pamper in their day spa is also on the menu. Featuring indulgent fully self-contained luxury penthouses and holiday apartments, Marina Shores has absolute waterfront living overlooking Abell Point Marina. Spoilt for choice are the 1,2,3 and 4 bedroom spa apartments and penthouses and with an onsite pool, it’ll be hard to want to leave. Offering a choice of either 1,2,3 or 4 bedroom apartments and penthouses, Peninsula Airlie Beach is another great choice to stay at. They say you won’t want to leave once you’ve checked in, so be sure to stock the fridge from the very get-go. All apartments have balconies and amazing views overlooking Abell Point Marina and the Coral Sea with high-quality features. The newest kid on the block, Heart Hotel and Gallery is located on the main street of Airlie Beach. Having first opened in 2016, the hotel is destined to become an iconic luxury, boutique choice for travellers to the Whitsundays. Don’t let the main street location fear you – the rooms are superb and has everything that you would expect from a 5-star hotel.